Philip Robinson's pioneering Ulster-Scots Grammar was first published in 1997 and a revised edition was issued in 2007. It fulfilled and continues to fulfil two vital purposes. First, it provides an essential reference book for those who wish to study, learn or teach Ulster-Scots. Secondly, it complements James Fenton’s Ulster-Scots dictionary, The Hamely Tongue, which deals with the Ulster-Scots language’s distinct and current vocabulary. Michael B. B. Montgomery (of the University of South Carolina) has justly praised Robinson's publication for its accessibility, an important feature of any reference book and particularly helpful to those coming to the study of the language for the first time. In order to document the fascinating history of the language, Robinson has undertaken a huge amount of historical research in manuscript libraries, dusty microfilms and local archives. He also includes an invaluable section entitled 'A reader of Ulster-Scots prose' and a very useful English/Ulster-Scots glossary for the uninitiated. 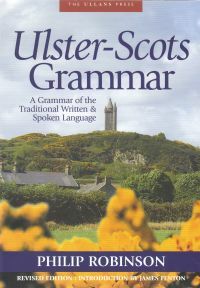 Robinson's Ulster-Scots Grammar has played and continues to play a crucial role in assisting those who wish to secure proper recognition for the language and the language's revival and future cultivation. James Fenton has generously but accurately described this book as 'meticulous, exhaustive and indispensable'. Robinson has laid solid foundations for the study of the language on which others may build.